Russian presidential press secretary Dmitry Peskov spoke to the Russian media about Moscow's stance on the events in Ukraine, the recipe for victory in the Sochi Olympics and how it feels to work under the president. 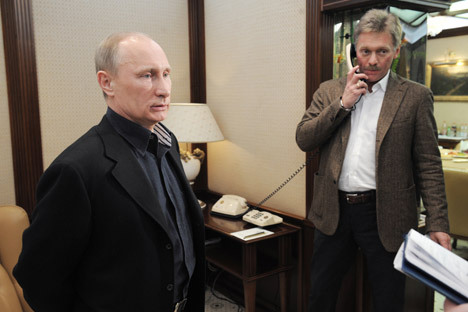 Dmitry Peskov has been in charge of handling Vladimir Putin’s press and media activities since 2000. Always approachable, the Russian media and the foreign press corps in Moscow have managed to establish a good rapport with the man who trained to be a diplomat and even served in the Russian embassy in Turkey. He spoke in detail to the media this week about the events in Ukraine, the up-coming Winter Olympics and how demanding the president can be. Dmitry Peskov was born to the family of a career diplomat in Moscow on October 17, 1967. After graduating from Moscow State University's Institute of Asian and African Studies in 1989, with a degree in oriental history, he went on to work in the Foreign Ministry and at the Soviet embassy in Turkey. “It is absolutely unacceptable for us to interfere with the internal affairs [of a foreign country]. We are convinced that the people in Kiev know what to do, and that they will find the best solutions in order to normalize the situation and put it back on a legitimate and peaceful track. “Some countries behave in a totally impudent and unceremonious way by attempting to discredit the Sochi Olympics politically. They throw plenty of dirt every day, and unfortunately, our media quotes them. The strong, the successful, the rich, and the healthy are not always loved. But the Olympic Games, the sports, are sacred, they have no relation to politics. The Olympic host country always wins if it invests its soul. In our case, I may say that we have already won. For the first time in decades a whole new city has been built in our country. Peskov supervises the Kremlin's public relations directorate, which coordinates the information activity of government ministries and departments in Russia and abroad. The directorate is also tasked with improving Russia's attractiveness for investments. “You know, I keep kicking myself for skipping university history classes, for example. Putin is a keen appreciator of history. When he starts delving on certain historical episodes I sometimes blush at my ignorance.